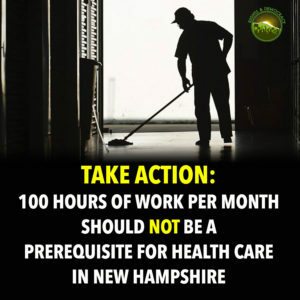 Republican lawmakers have requested a federal waiver to impose a harsh work requirement on recipients of Medicaid Expansion in the Granite State. Folks who want to remain on Medicaid Expansion will now be forced to work 25 hours a week (100 hours a month) to receive health insurance. Your help is needed to show strong, widespread opposition to these work requirements. Submit a comment to the New Hampshire Department of Health and Human Services.They are currently asking the public to weigh in on whether the government should approve the waiver. A big deluge of comments will make it harder for them to justify approval and will strengthen the case against work requirements when this matter goes to courts. Comments must be received by 5 pm on June 29. Use any of the bullet points in this email to help you write a strong paragraph. 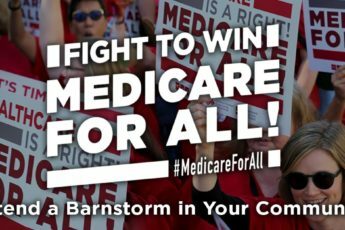 Send your comment to: nhmedicaidcaremanagement@dhhs.nh.gov. Write a letter to your local newspaper or your local legislator using the bullet points below. We are happy to take a look at what you’ve written and help you fine-tune it. If you or someone you know has a powerful health care story to tell, take a minute to fill out this short form on our website and someone will be in touch. Please let us know if you take any of these actions! Personalize it with your own story if at all possible – this does make a difference. Work requirements should not be a condition of receiving health care. These changes may lead to loss of health insurance for people who don’t have the stamina to work 25 hours a week. If work could not be found, unpaid community service would have to be substituted, amounting to a forced labor situation. Seasonal and self-employed workers who experience gaps in employment may also lose coverage because they won’t meet the required 100 hours every month. Some people live in areas of the state where finding suitable employment and securing reliable transportation to a job may be very difficult. Reporting would happen monthly, so if workers missed shifts because of illness, they could be at risk of losing health insurance. People who suffer from mental illness may have periods when they are unable to work. The number of identification forms required of people to enroll could make it much more difficult, if not cost-prohibitive, for low-income folks to participate. There is an exemption on the work requirement for people who are ill or caring for children or family members, but how difficult will it be for someone to find out if they are eligible for the exemption? Financial assets and citizenship status do not determine eligibility so we should not collect this information from people as a condition of enrollment. If someone with school-aged children needs childcare during work hours, which is very expensive and not available everywhere, what is the plan for providing it? Retroactive coverage will be eliminated. This will lead to increased uncompensated care, hurt recovery centers and community health centers, and prevent people from seeking medical care when they need it.